Isabella Markham appeared on Show 206, recorded in November 2009, at age 14. Isabella Markham (viola), 14, is a recipient of From the Top’s Jack Kent Cooke Young Artist Award. She began lessons at the Suzuki Institute of Dallas at age five, under the condition that she would give music a try if her parents would let her get a snake (a candy cane albino corn snake named Fluffy). Isabella is a ninth grader at J.J. Pearce High School in Dallas. 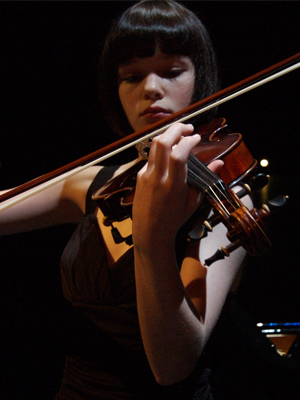 She is the principal violist of the New Conservatory of Dallas Orchestra. This past summer she attended The Perlman Music Program on Shelter Island, New York, where she studied under the direction of Itzhak and Toby Perlman, among others. When she isn’t practicing Isabella enjoys spending time with friends, painting, drawing, riding her bike and trying exotic foods. Isabella is a Jack Kent Cooke Young Artist.